KATHMANDU, July 20: The CEO of the National Reconstruction Authority (NRA), Sushil Gyewali, has said that donor agencies are firm on releasing the grant amount of Rs 200,000 for reconstructing damaged houses in the earthquake hit districts in three installments instead of two. Talking to a group of journalists on Tuesday, Gyewali said the donors are expressing serious concerns over the government's plan to revise the grant distribution modality from three installments to two arguing that the change in plan could compromise the quality of construction of the earthquake-resistant buildings in the quake-hit districts. 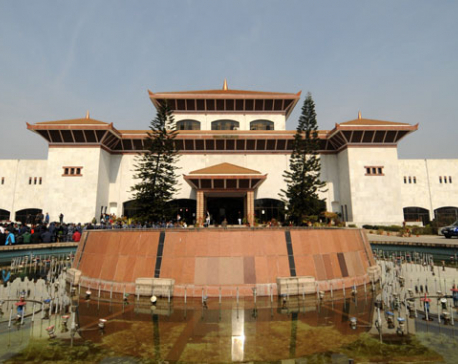 After the main opposition Nepali Congress (NC) obstructed parliament for five days last month demanding that the government release Rs 150,000 in the first installment and 50,000 in the second, the government had agreed to release the grant in two installments. "But donors are adamant that the grant amount should be released in three installments as they say the three-installment modality gives ample time to ensure that the reconstructed houses are resilient to earthquakes," said Gyewali. He said that the donors fear that releasing Rs 150,000 in the first installment may lead to misuse of the money. "Their major concern is ensuring resilient building constructions in the quake-affected districts as not doing so may lead to further loss of lives and properties in case of another earthquake in the future. And they say that three-installment modality alone can serve better to achieve the goal of build back better," he said. Under the three-installment modality, the local authorities inspect the victim's houses thrice in the course of construction. At first, NRA releases the first installment of Rs 50,000 each to the quake victims to construct the foundation and pillars. Only after ensuring that the foundation is in line with the criteria set by the NRA, that the NRA will release the second installment of Rs 70,000. And after NRA makes a final inspection of the houses, the last installment of Rs 80,000 will be released. NRA has already mobilized over 2,000 engineers for assisting the victims in constructing earthquake resilient houses. Right after the government reached an understanding with the main opposition NC to release the grant amount in two tranches, the World Bank, one of the major donors in the tasks of reconstruction and rehabilitation, had written to the government objecting to the two-installment plan. Similarly, other donors like the European Union have also been showing concerns over the government decision to release the grant in two tranches, according to NRA officials. The bank has offered half a billion dollars for the reconstruction work, including a fund of US $250 million for rural housing grants. Other development partners involved in the rural housing reconstruction program are Japan International Corporation Agency (with $100 million credit), European Union, and a fund under the Multi Donor Trust Fund (MDTF) which is coordinated by the World Bank. USAID (US$ 9.6 million), Switzerland (Swiss francs 9 million) and Canada (Canadian $10 million) are in the MDTF. CEO Gyewali also said that all the quake victims in the 11 districts worst hit by the earthquake will get the first installment of Rs 50,000 before the Dashain festival. "We have already expedited the process of signing grant agreement with the quake victims. They will soon start receiving the first installment. All the quake victims will get the first tranche before Dashain (October)," said he. He said that NRA had planned to release the first installment by mid-August but could not do so due to administrative delays by the local authorities citing work pressure at the end of the fiscal year, which ended in mid-July. "The local authorities will soon focus on grant distribution. The victims will get the first tranche Dashain," he added. As many as 533,155 households have been identified as eligible for receiving the grant amount of Rs 200,000 in the 11 districts.